Many morphological elements decorate the building's facets and there are ceiling paintings of exceptional art in its interior. 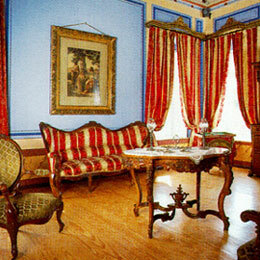 All the furniture and utensils on upper floor are conserved and attended to as in a museum. 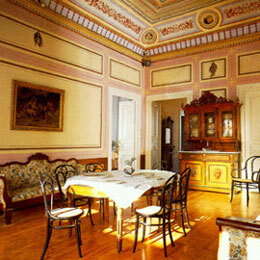 This way, the visitor can get acquainted with the residence of a 19th century landowner of Santorini. The Mansion was built in 1888 by the landowner and wine merchant George Argyros, on the land of a previously existing traditional building that occupied a quarter of an acre. During the 1956 earthquake, the whole of the building suffered damages and its south east corner collapsed together with the main hall's roof. Since then, the mansion remained uninhabited for many years. Today it belongs to the company A.X.T.E.FLORA S.A. and is completely restored. 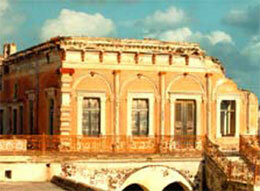 The ground floor serves as a five star hostel while there are guided tours for the public on the upper floor. 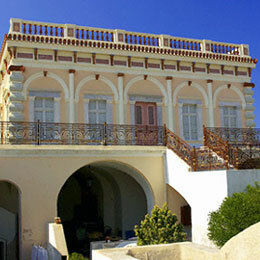 The Argyros Mansion's complete restoration was approved by the Ministry of Culture. The architect Flora Nastouli and the civil engineer A. Talaiporos of the Static Society, made the studies for the restoration project. By a ministerial decree of 1985, the building was identified as a Work of Art encircled by a 50 meters protection zone.